Jaalle Mohamed Siad Barre (Somali: Jaale Maxamed Siyaad Barre; Arabic: محمد سياد بري‎; October 6, 1919 – January 2, 1995) was a Somali politician who served as the President of the Somali Democratic Republic from 1969 to 1991. 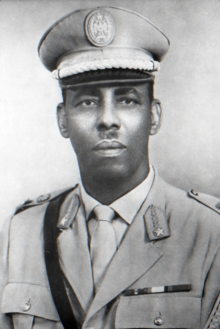 Barre, a major general of the gendarmerie, became President of Somalia after the 1969 coup d'état that overthrew the Somali Republic following the assassination of President Abdirashid Ali Shermarke. The Supreme Revolutionary Council military junta under Barre reconstituted Somalia as a one-party Marxist–Leninist communist state, renaming the country the Somali Democratic Republic and adopting scientific socialism, with support from the Soviet Union. Barre's early rule was characterised by widespread modernization, nationalization of banks and industry, promotion of cooperative farms, a new writing system for the Somali language, and anti-tribalism. The Somali Revolutionary Socialist Party became Somalia's vanguard party in 1976, and Barre started the Ogaden War against Ethiopia on a platform of Somali nationalism and pan-Somalism. Barre's popularity was highest during the seven months between September 1977 and March 1978 when Barre captured virtually the entirety of the Somali region. It declined from the late-1970s following Somalia's defeat in the Ogaden War, triggering the Somali Rebellion and severing ties with the Soviet Union. Opposition grew in the 1980s due to his increasingly dictatorial rule, growth of tribal politics, abuses of the National Security Service including the Isaaq genocide, and the sharp decline of Somalia's economy. In 1991, Barre's government collapsed as the Somali Rebellion successfully ejected him from power, leading to the Somali Civil War, and forcing him into exile where he died in Nigeria in 1995. Mohamed Siad Barre was born on October 6, 1919, near Shilavo, a town in the predominately Somali-populated Ogaden region of the Ethiopian Empire, into the Somali Marehan Darod clan and the sub-clan of Rer Dini. Barre's parents died when he was ten years old, and after receiving his primary education in the town of Luuq in southern Italian Somalia moved to the capital Mogadishu to pursue his secondary education. In 1935, Barre enrolled in the Italian colonial police as a Zaptié despite being ineligible as he was born in Ethiopia, instead claiming to have been born in Garbahaareey in order to qualify. Barre seems to have probably participated as a Zaptié in the southern theatre of the Italian conquest of Ethiopia in 1936, and later joined the colonial police force during the British Somaliland military administration, rising to major general, the highest possible rank. In 1946, Barre supported the Somali Conference (Italian: Conferenza Somala), a political group of parties and clan associations that were hostile to the Somali Youth League and were supported by the local Italian farmers. The group presented a petition to the "Four Powers" Investigation Commission in order to allow that the administration of the United Nations Trust Territory could be entrusted for thirty years to Italy. In 1950, shortly after Italian Somaliland became a United Nations Trust Territory under Italian administration for ten years, Barre (who was fluent in Italian) attended the Carabinieri police school in Florence for two years. Upon his return to Somalia, Barre remained with the military and eventually became Vice Commander of the Somali Army when the country gained its independence in 1960 as the Somali Republic. In the early 1960s, after spending time with Soviet officers in joint training exercises, Barre became an advocate of Soviet-style Marxist-Leninist government, believing in a socialist government and a stronger sense of Somali nationalism. In 1969, following the assassination of Somalia's second president, Abdirashid Ali Shermarke, the military staged the 1969 coup d'état on October 21, the day after Shermarke's funeral, overthrowing the Somali Republic's government. The Supreme Revolutionary Council (SRC), a military junta led by Major General Barre, Lieutenant Colonel Salaad Gabeyre Kediye and Chief of Police Jama Korshel, assumed power and filled the top offices of the government, with Kediye officially holding the title of "Father of the Revolution," although Barre shortly afterwards became the head of the SRC. The SRC subsequently renamed the country the Somali Democratic Republic, arrested members of the former government, banned political parties, dissolved the parliament and the Supreme Court, and suspended the constitution. Barre assumed the position of President of Somalia, styled the "Victorious Leader" (Guulwade), and fostered the growth of a personality cult with portraits of him in the company of Marx and Lenin lining the streets on public occasions. Barre advocated a form of scientific socialism based on the Qur'an and Marxism, with heavy influences of Somali nationalism. The Supreme Revolutionary Council established large-scale public works programs and successfully implemented an urban and rural literacy campaign, which helped dramatically increase the literacy rate. Barre began a program of nationalising industry and land, and the new regime's foreign policy placed an emphasis on Somalia's traditional and religious links with the Arab world, eventually joining the Arab League in 1974. That same year, Barre also served as chairman of the Organization of African Unity (OAU), the predecessor of the African Union (AU). A new constitution was promulgated in 1979 under which elections for a People's Assembly were held. However, Barre's Somali Revolutionary Socialist Party politburo continued to rule. In October 1980, the SRSP was disbanded, and the Supreme Revolutionary Council was re-established in its place. One of the first and principal objectives of the revolutionary regime was the adoption of a standard national writing system. Barre supported the official use of Latin script for the Somali language, replacing Arabic script and Wadaad writing that had been used for centuries. Shortly after coming to power, Barre introduced the Somali language (Af Soomaali) as the official language of education, and selected the modified Somali Latin alphabet developed by the Somali linguist Shire Jama Ahmed as the nation's standard orthography. From then on, all education in government schools had to be conducted in Somali, and in 1972, all government employees were ordered to learn to read and write Somali within six months. The reason given for this was to decrease a growing rift between those who spoke the colonial languages, Italian or English, and those who did not, as many of the high ranking positions in the former government were given to people who spoke either Italian or English. Additionally, Barre also sought to eradicate the importance of the Somali clan system (qabil) within Somalia's government and civil society. The inevitable first question that Somalis asked one another when they met was, '"What is your clan? ", but when this was considered to be against to the purpose of a modern state, Somalis began to pointedly ask, "What is your ex-clan?". Barre outlawed this question and a broad range of other activities classified as "clanism", with informers reporting qabilists, those considered to propagate the clan system, to the government, leading to arrests and imprisonment. On a more symbolic level, Barre had repeated a number of times, "Whom do you know? is changed to: What do you know? ", and this incantation became part of a popular street song in Somalia. He also promoted a number of favored greetings, such as the singular jaalle (comrade) or the plural jaalleyaal (comrades). Barre advocated the concept of a Greater Somalia (Soomaaliweyn), which refers to those regions in the Horn of Africa in which ethnic Somalis reside and have historically represented the predominant population. Greater Somalia encompasses Somalia, Djibouti, the Ogaden in Ethiopia, and Kenya's former North Eastern Province, regions of the Horn of Africa where Somalis form the majority of the population to some proportion.In July 1977, the Ogaden War broke out after the Barre's government sought to incorporate the various Somali-inhabited territories of the region into a Greater Somalia, beginning with the Ogaden. The Somali national army invaded Ethiopia, which was now under communist rule of the Soviet-backed Derg, and was successful at first, capturing most of the territory of the Ogaden. The invasion reached an abrupt end with the Soviet Union's shift of support to Ethiopia, followed by almost the entire communist world siding against Somalia. The Soviets halted their previous supplies to Barre's regime and increased the distribution of aid, weapons, and training to the Ethiopian government, and also brought in around 15,000 Cuban troops to assist the Ethiopian regime. In 1978, the Somali troops were ultimately pushed out of the Ogaden. Control of Somalia was of great interest to both the Soviet Union and the United States due to the country's strategic location at the mouth of the Red Sea. After the Soviets broke with Somalia in the late 1970s, Barre subsequently expelled all Soviet advisers, tore up his friendship treaty with the Soviet Union, and switched allegiance to the West. The United States stepped in and until 1989, was a strong supporter of the Barre government for whom it provided approximately US$100 million per year in economic and military aid. In September 1972 Tanzanian-sponsored rebels attacked Uganda. Ugandan President Idi Amin requested Barre's assistance, and he subsequently mediated a non-aggression pact between Tanzania and Uganda. For his actions, a road in Kampala was named after Barre. On October 17 and October 18, 1977, a Popular Front for the Liberation of Palestine (PFLP) group hijacked Lufthansa Flight 181 to Mogadishu, holding 86 hostages. West German Chancellor Helmut Schmidt and Barre negotiated a deal to allow a GSG 9 anti-terrorist unit into Mogadishu to free the hostages. During the first five years, Barre's government set up several cooperative farms and factories of mass production such as mills, sugar cane processing facilities in Jowhar and Afgooye, and a meat processing house in Kismayo. Another public project initiated by the government was the Shalanbood Sanddune Stoppage: from 1971 onwards, a massive tree-planting campaign on a nationwide scale was introduced by Barre's administration to halt the advance of thousands of acres of wind-driven sand dunes that threatened to engulf towns, roads, and farm land. By 1988, 265 hectares of a projected 336 hectares had been treated, with 39 range reserve sites and 36 forestry plantation sites established. Between 1974 and 1975, a major drought referred to as the Abaartii Dabadheer ("The Lingering Drought") occurred in the northern regions of Somalia. The Soviet Union, which at the time maintained strategic relations with the Barre government, airlifted some 90,000 people from the devastated regions of Hobyo and Caynaba. New settlements of small villages were created in the Jubbada Hoose (Lower Jubba) and Jubbada Dhexe (Middle Jubba) regions, with these new settlements known as the Danwadaagaha or "Collective Settlements". The transplanted families were introduced to farming and fishing, a change from their traditional pastoralist lifestyle of livestock herding. Other such resettlement programs were also introduced as part of Barre's effort to undercut clan solidarity by dispersing nomads and moving them away from clan-controlled land. As part of Barre's socialist policies, major industries and farms were nationalised, including banks, insurance companies and oil distribution farms. By the mid-to-late-1970s, public discontent with the Barre regime was increasing, largely due to corruption among government officials as well as poor economic performance. The Ogaden War had also weakened the Somali army substantially and military spending had crippled the economy. Foreign debt increased faster than export earnings, and by the end of the decade, Somalia's debt of 4 billion shillings equaled the earnings from seventy-five years' worth of banana exports. By 1978, manufactured goods exports were almost non-existent, and with the lost support of the Soviet Union the Barre government signed a structural adjustment agreement with the International Monetary Fund (IMF) during the early 1980s. This included the abolishment of some government monopolies and increased public investment. This and a second agreement were both cancelled by the mid-1980s, as the Somali army refused to accept a proposed 60 percent cut in military spending. New agreements were made with the Paris Club, the International Development Association and the IMF during the second half of the 1980s. This ultimately failed to improve the economy which deteriorated rapidly in 1989 and 1990, and resulted in nationwide commodity shortages. In May 1986, President Barre suffered serious injuries in a life-threatening automobile collision near Mogadishu, when the car that was transporting him smashed into the back of a bus during a heavy rainstorm. He was treated in a hospital in Saudi Arabia for head injuries, broken ribs and shock over a period of a month. Lieutenant General Mohamed Ali Samatar, then Vice President, subsequently served as de facto head of state for the next several months. Although Barre managed to recover enough to present himself as the sole presidential candidate for re-election over a term of seven years on December 23, 1986, his poor health and advanced age led to speculation about who would succeed him in power. Possible contenders included his son-in-law General Ahmed Suleiman Abdille, who was at the time the Minister of the Interior, in addition to Barre's Vice President Lt. Gen. Samatar. In September 1970, the government introduced the National Security Law No. 54, which granted the NSS the power to arrest and detain indefinitely those who expressed critical views of the government, without ever being brought to trial. It further gave the NSS the power to arrest without a warrant anyone suspected of a crime involving "national security". Article 1 of the law prohibited "acts against the independence, unity or security of the State", and capital punishment was mandatory for anyone convicted of such acts. From the late 1970s, and onwards Barre faced a shrinking popularity and increased domestic resistance. In response, Barre's elite unit, the Red Berets (Duub Cas), and the paramilitary unit called the Victory Pioneers carried out systematic terror against the Majeerteen, Hawiye, and Isaaq clans. The Red Berets systematically smashed water reservoirs to deny water to the Majeerteen and Isaaq clans and their herds. More than 2,000 members of the Majeerteen clan died of thirst, and an estimated 5,000 Isaaq were killed by the government. Members of the Victory Pioneers also raped large numbers of Majeerteen and Isaaq women, and more than 300,000 Isaaq members fled to Ethiopia. By the mid-1980s, more resistance movements supported by Ethiopia's communist Derg administration had sprung up across the country. Barre responded by ordering punitive measures against those he perceived as locally supporting the guerillas, especially in the northern regions. The clampdown included bombing of cities, with the northwestern administrative center of Hargeisa, a Somali National Movement (SNM) stronghold, among the targeted areas in 1988. The bombardment was led by General Mohammed Said Hersi Morgan, Barre's son-in-law, and resulted in the deaths of 50,000 people in the north. After fallout from the unsuccessful Ogaden campaign, Barre's administration began arresting government and military officials under suspicion of participation in an abortive 1978 coup d'état. Most of the people who had allegedly helped plot the putsch were summarily executed. However, several officials managed to escape abroad and started to form the first of various dissident groups dedicated to ousting Barre's regime by force. A new constitution was promulgated in 1979 under which elections for a People's Assembly were held. However, Barre's Somali Revolutionary Socialist Party politburo continued to rule. In October 1980, the SRSP was disbanded, and the Supreme Revolutionary Council was re-established in its place. By that time, the moral authority of Barre's ruling Supreme Revolutionary Council had begun to weaken. Many Somalis were becoming disillusioned with life under military dictatorship. The regime was further weakened in the 1980s as the Cold War drew to a close and Somalia's strategic importance was diminished. The government became increasingly totalitarian, and resistance movements, supported by Ethiopia's communist Derg administration, sprang up across the country. This eventually led in 1991 to the outbreak of the civil war, the toppling of Barre's regime and the disbandment of the Somali National Army (SNA). Among the militia groups that led the rebellion were the Somali Salvation Democratic Front (SSDF), United Somali Congress (USC), Somali National Movement (SNM) and the Somali Patriotic Movement (SPM), together with the non-violent political oppositions of the Somali Democratic Movement (SDM), the Somali Democratic Alliance (SDA) and the Somali Manifesto Group (SMG). Siad Barre escaped from his palace towards the Kenyan border in a tank  Many of the opposition groups subsequently began competing for influence in the power vacuum that followed the ouster of Barre's regime. In the south, armed factions led by USC commanders General Mohamed Farah Aidid and Ali Mahdi Mohamed, in particular, clashed as each sought to exert authority over the capital. After fleeing Mogadishu in January 1991, Barre temporarily remained in the southwestern Gedo region of the country, which was the stronghold for his family. From there, he launched a military campaign to return to power. He twice attempted to retake Mogadishu, but in May 1991 was overwhelmed by General Mohamed Farrah Aidid's army, and was forced into exile. Barre initially moved to Nairobi, Kenya, but opposition groups with a presence there protested his arrival and support of him by the Kenyan government. In response to the pressure and hostilities, he moved two weeks later to Nigeria. Barre died on January 26, 1995 in Lagos from a heart attack. He was buried in Garbahaareey District in the Gedo region of Somalia. ^ a b Greenfield, Richard (1995-01-03). "Obituary: Mohamed Said Barre". The Independent. Retrieved 2017-03-07. ^ Kapteijns, Lidwien (2012-12-18). Clan Cleansing in Somalia: The Ruinous Legacy of 1991. University of Pennsylvania Press. ISBN 0812207580. ^ James, George (1995-01-03). "Somalia's Overthrown Dictator, Mohammed Siad Barre, Is Dead". The New York Times. Retrieved 2017-07-01. ^ Yihun, Belete Belachew. "Ethiopian foreign policy and the Ogaden War: the shift from “containment” to “destabilization,” 1977–1991." Journal of Eastern African Studies 8.4 (2014): 677-691. ^ Library of Congress. Federal Research Division (1993). "Siad Barre and Scientific Socialism". In Metz, Helen Chapin (ed.). Somalia: A Country Study. U.S. Government Publishing Office. ISBN 9780844407753. ^ Library of Congress. Federal Research Division (1993). "Siad Barre's Repressive Measures". In Metz, Helen Chapin (ed.). Somalia: A Country Study. U.S. Government Publishing Office. ISBN 9780844407753. ^ Library of Congress. Federal Research Division (1993). "The Social Order". In Metz, Helen Chapin (ed.). Somalia: A Country Study. U.S. Government Publishing Office. ISBN 9780844407753. ^ a b Laitin, David D.; Samatar, Said S. (1987). Somalia: nation in search of a state. Boulder: Westview Press. p. 79. ^ a b c d e Frankel, Benjamin (1992). The Cold War, 1945-1991: Leaders and other important figures in the Soviet Union, Eastern Europe, China, and the Third World. Gale Research. p. 306. ISBN 9780810389281. ^ "President Siad Barre life (German)". Archived from the original on 27 July 2011. Retrieved 28 October 2017. ^ Mohamed Amin (5 March 2014). "President Mohamed Siad Barre and Somali Officials speaking italian Part 1" – via YouTube. ^ Adam, Hussein Mohamed; Ford, Richard (1997). Mending rips in the sky: options for Somali communities in the 21st century. Red Sea Press. p. 226. ISBN 9781569020739. ^ Library of Congress. Federal Research Division (1993). "Coup d'Etat". In Metz, Helen Chapin (ed.). Somalia: A Country Study. U.S. Government Publishing Office. ISBN 9780844407753. ^ a b c d Peter John de la Fosse Wiles, The New Communist Third World: an essay in political economy, (Taylor & Francis: 1982), p.279. ^ Fage, J. D.; Crowder, Michael; Oliver, Roland Anthony (1984). The Cambridge History of Africa. 8. Cambridge University Press. p. 478. ISBN 9780521224093. ^ a b c The Encyclopedia Americana: complete in thirty volumes. Skin to Sumac. 25. Grolier. 1995. p. 214. ISBN 9780717201266. ^ Metz, Helen C. (ed.) (1992), "Siad Barre and Scientific Socialism", Somalia: A Country Study, Washington, D.C.: Library of Congress CS1 maint: Extra text: authors list (link). ^ Jaamac, Faarax Maxamed. Aqoondarro waa u Nacab Jacayl. Jamhuuriyadda Dimoqraadiga Soomaaliya, Wasaaradda Hiddaha iyo Tacliinta Sare, 1974. ^ Mugabe, Faustin (20 November 2017). "Somalia's Siad Barre saves Amin from Tanzanians". Daily Monitor. Retrieved 28 March 2019. ^ National Geographic Society (U.S.), National Geographic, Volume 159, (National Geographic Society: 1981), p.765. ^ Metz, Helen C. (ed.) (1992), "The Socialist Revolution After 1975", Somalia: A Country Study, Washington, D.C.: Library of Congress CS1 maint: Extra text: authors list (link). ^ Amnesty International, Torture in the Eighties, (Bristol, England: Pitman Press, 1984), p. 127. ^ National Academy of Sciences (U.S.) Committee on Human Rights & Institute of Medicine (U.S.) Committee on Health and Human Rights, Scientists and human rights in Somalia: report of a delegation, (Washington D.C.: National Academy Press, 1988), p. 16. ^ Metz, Helen C. (ed.) (1992), "Siad Barre's Repressive Measures", Somalia: A Country Study, Washington, D.C.: Library of Congress CS1 maint: Extra text: authors list (link). ^ Metz, Helen C. (ed.) (1992), "Persecution of the Majeerteen", Somalia: A Country Study, Washington, D.C.: Library of Congress CS1 maint: Extra text: authors list (link). ^ Metz, Helen C. (ed.) (1992), "Oppression of the Isaaq", Somalia: A Country Study, Washington, D.C.: Library of Congress CS1 maint: Extra text: authors list (link). ^ "Somalia — Government". Library of Congress. Retrieved February 15, 2014. ^ Perlez, Jane; Times, Special to The New York (28 October 1991). "Insurgents Claiming Victory in Somalia". Retrieved 28 October 2017 – via www.nytimes.com. Shire, Mohammed Ibrahim, Somali President Mohammed Siad Barre: His Life and Legacy, (Cirfe Publications, 2011).